A common challenge that those in middle management jobs large organizations and companies often encounter is the difficulty in getting new employees to fill in specific roles in their department. This mainly happens because of the size of the organization and job requisitions needs to be approved by multiple people before it can finally be acted upon by the human resource department. This issue often needs a system-wide and holistic solution like standardizing and shortening the employee acquisition process that every employee in every job level needs to adhere to. Different organizations will have different ways to implement this. But a simple acquisition strategy that seems to hold universal preference in every company and organization is the use of personnel requisition forms. 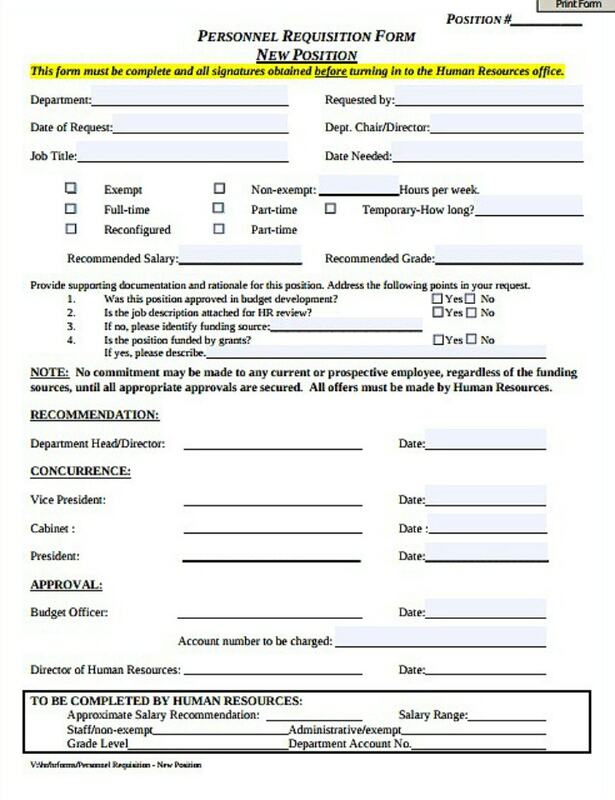 In this article, we specifically discuss how human resource officers can further improve their respective organization’s personnel requisition forms to hasten the employee hiring process and provide tips for those who need to fill out personnel requisition forms. 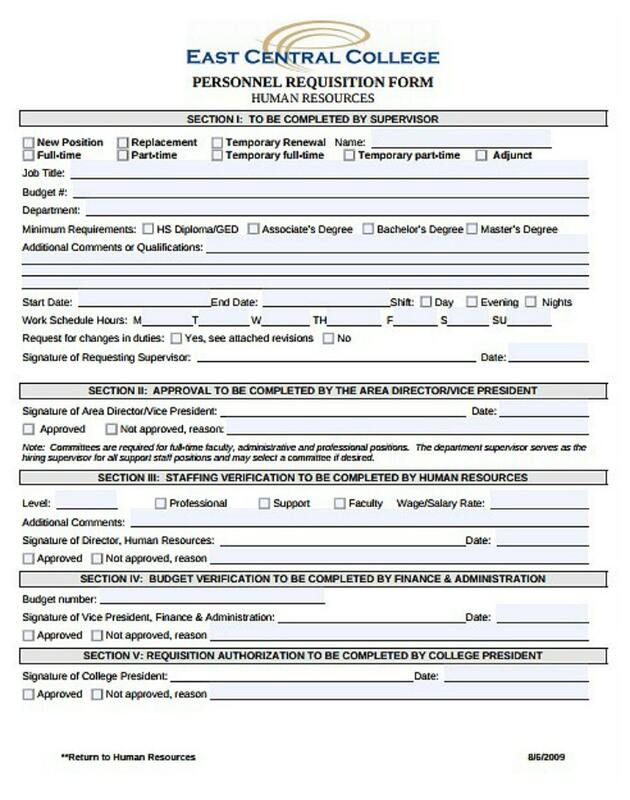 In addition, we also provide examples of printable templates that any organization can use to base their personnel requisition forms from. 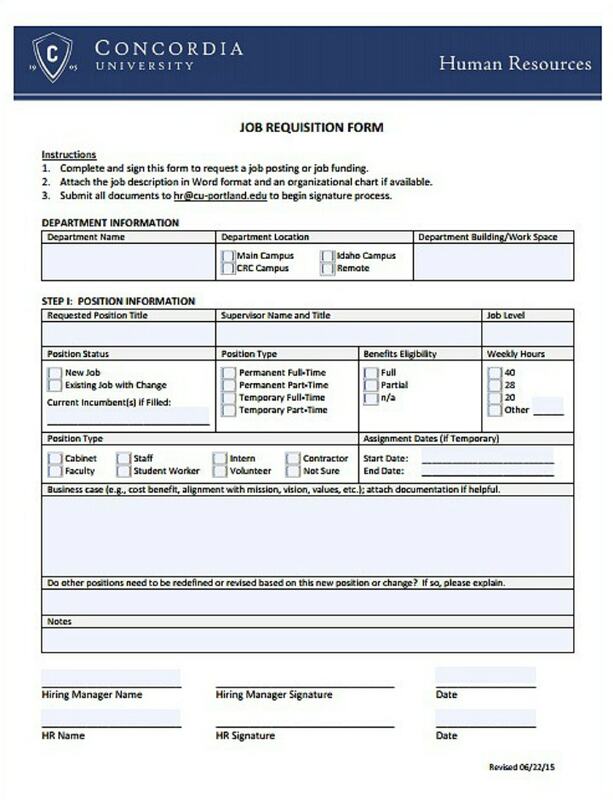 As promised, this article is filled with personnel requisition form templates that real life businesses and organizations use to help facilitate their employee hiring process. All these templates are available as letter PDF template files and you will need to have Adobe Acrobat Reader installed on your computer before you can open and edit the template. What is a Personnel Requisition Form? In layman’s terms, a personnel requisition form is a document that authorized middle management heads fills out if they want their company to hire a new employee for their department or office. For example, if the Political Science department of a big university needs new professors, the department head (usually the dean of the college) will need to fill out and submit a personnel requisition form to the university’s human resource department. 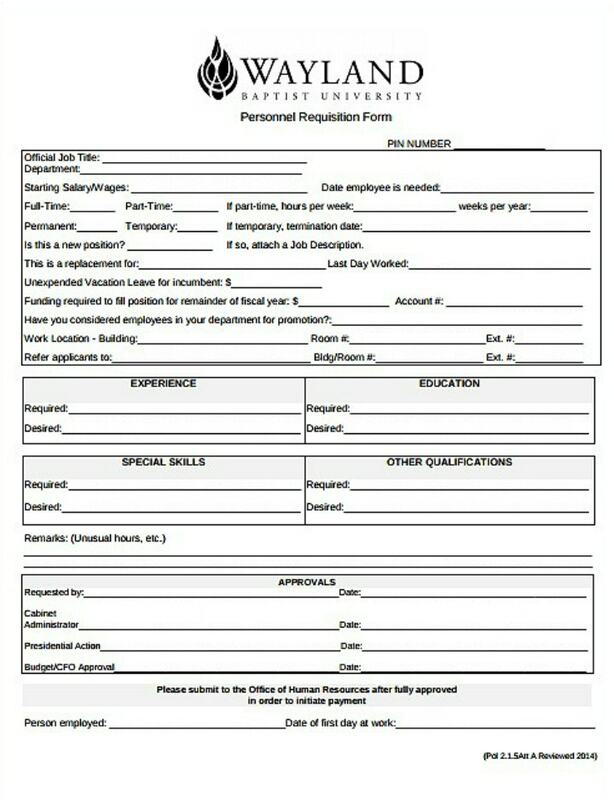 A personnel requisition form may be likened to a job order form. 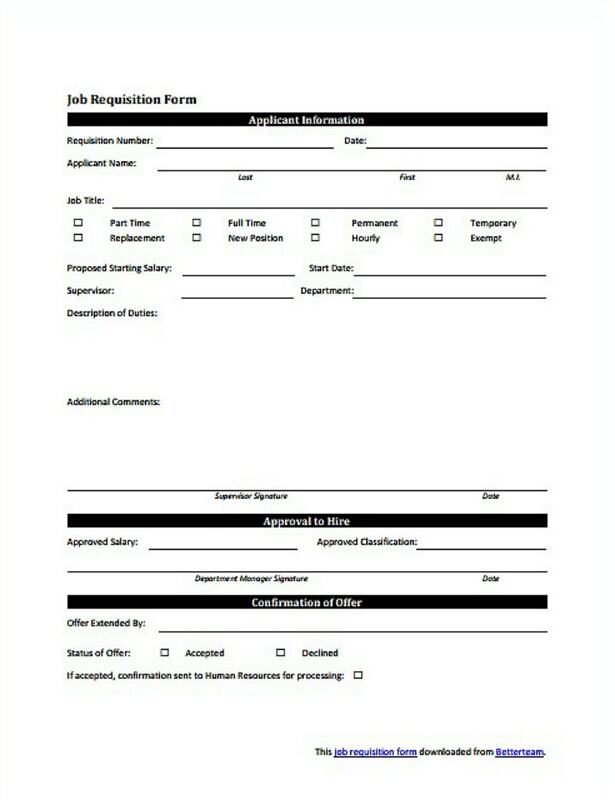 But in the case of this type of requisition form, the requestor is asking for more employees to do a specific job. These forms will include a detailed portion for the requestor to write down the specific qualifications and other eligibility requirements that he or she needs. Once submitted to the organization’s HR department, the request will be evaluated based on the organization’s or the company’s hiring process and other criteria. And when the personnel requisition request is approved, the HR team will post the job vacancy into job boards and other advertised means. 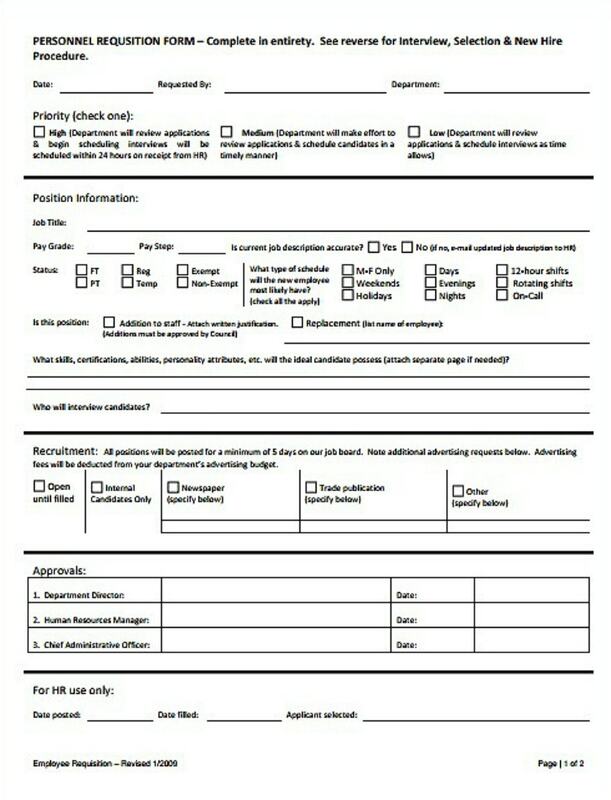 Personnel requisition forms are often printed on high-quality paper. They are also called job requisition forms or employee requisition forms. Creating employee requisition forms is something often done by the human resource department of most companies and large organizations. In effect, these printable forms will have different formats. But still, all these forms function in the same basic way. So if you are tasked with creating or improving your organization’s employee requisition forms, we have listed a few tips on how to do just that. Read them below. You may also see material order forms. 1. 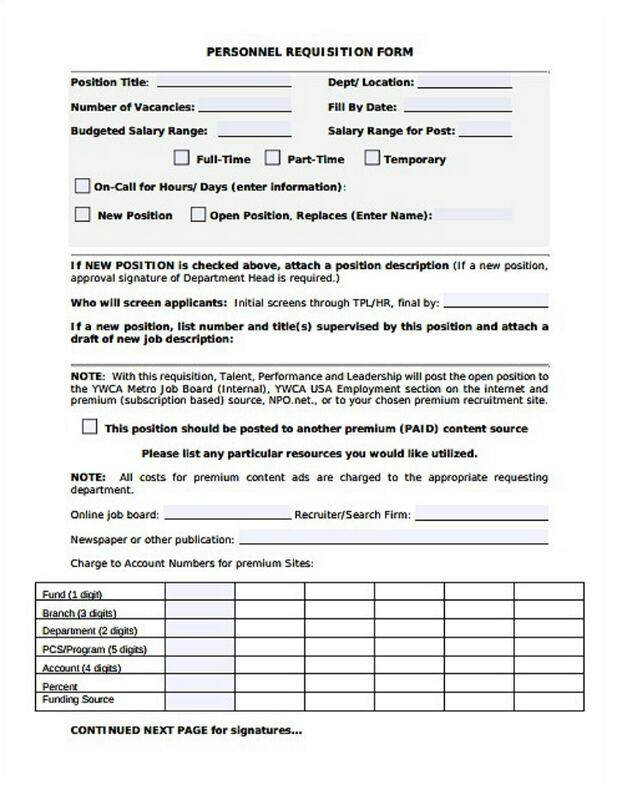 Make sure to include a section for the Position Information. A staple of any employee requisition form is the portion for the requestor to write down the details of the position or job it wants to be filled. This section of the form will include a set of questions about the type of job, its salary grade, work schedule, the source of funds, and other details that the requestor wants to be known on the job board ad. To make this part of the form easier to fill out, it is best to make use of tick boxes or checklists. This way, the requestor will just have to mark the option that will best fit their requirements. And if the list of choices is not sufficient, you may always include a free-writing portion on the form. You may also see excel form templates. Remember that your goal as the person designing your organization’s employee requisition forms is to make the filling out process smoother and more convenient for the requestor. 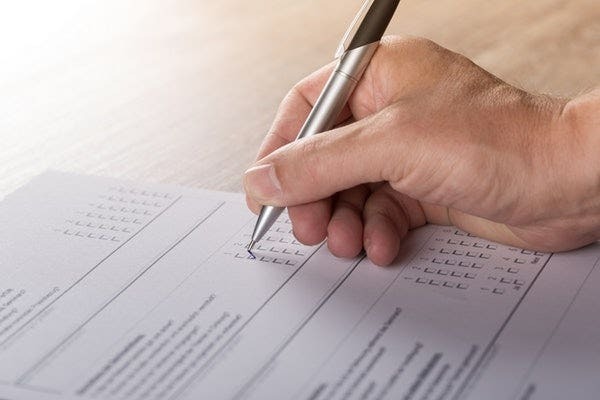 By employing different time-saving elements on the design of the form, you are helping improve the requestor’s user experience of the requisition form. 2. Add a section for departmental comments and approvals. The next section that should be added to any employee requisition form is a section for departmental comments. As we have mentioned earlier, employee requisition forms need to be approved by multiple people before the final job listing is published and released to the public. That is why you should make sure that there will be ample space for all the job requisition form evaluators to sign and comment on. Most organizations will have a designated personnel who is tasked with evaluating and approving any job requisition forms. So if you already know their names and designations, you may already include this on the form templates before you print and distribute them. You may also see equipment order forms. 3. Do not forget to add a section for to the Prospect Search Proposal. Another must-have section on any employee requisition form is a portion for the requestor to write down how he/she/the department intends to look for the best employee/s who will fit all the job qualifications that they have specified earlier. This is an important portion since it will detail how this particular job listing or hiring will conform to the company’s affirmative action policy. You may also see fashion order forms. Remember that in the United States, organizations and businesses are required to comply with Equal Opportunity and Diversity laws. That is why this section of the employee requisition form is a must-have. 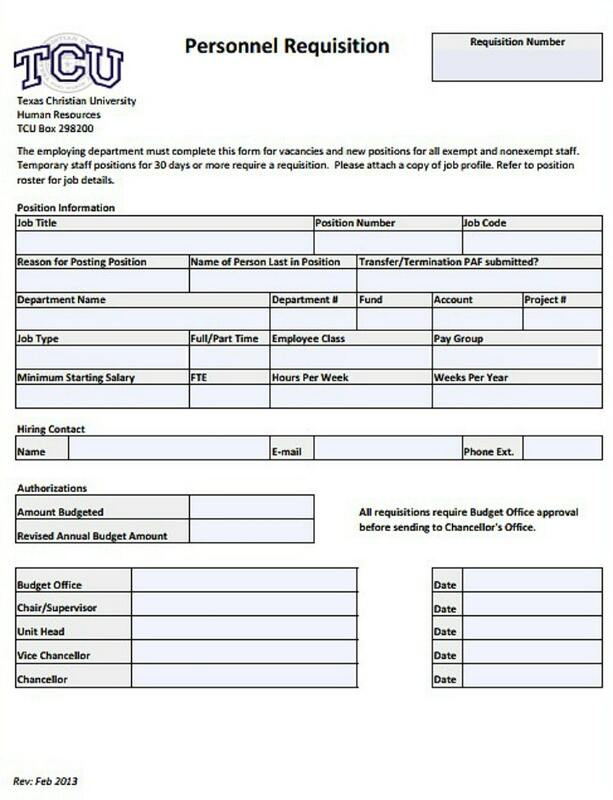 You may also check this article on different job descriptions to help create a better requisition form template. 4. Provide ample space for answers. When creating an employee requisition form, there can be multiple instances when the requestor’s specific instructions for hiring someone is so extensive and detailed. To cope with this kind of situations in the future, it is best to make sure that your requisition form has ample space for free-writing answers or entries. Doing this can also be beneficial for those who want to make sure that they cover all the bases when it comes to requests for new employees. 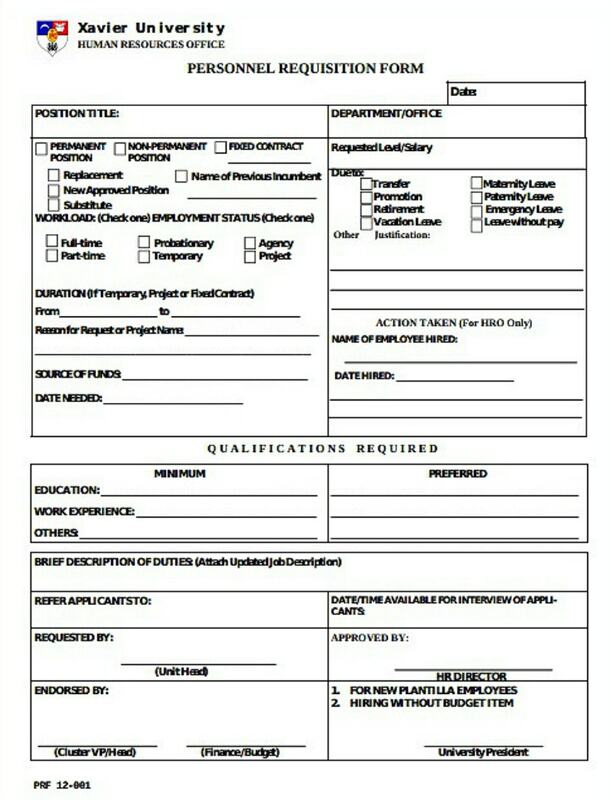 And as we have mentioned earlier, most employee requisition forms will have a dedicated section for any comments and approvals from the people who will evaluate the job requisition request. To preempt having any evaluations or comments written on the firm’s margins, it pays to make sure that there is enough space for the form evaluators to write down their comments and/or objections to the requisition request. You may also see change order forms. 5. Incorporate checklist, tables, and tick boxes. Another good tip that an human resource personnel should follow when creating an employee requisition form is the use of checklists, tables, tick boxes, and other techniques that will help ensure that anyone filling out the form will have an easy time doing so. This means that your ultimate goal when creating any kind of human resource form or template should be the convenience of the persons filling out the form and those who will get to review the form. Checklists, tables, and tick boxes are the most common ways to simplify a form or questionnaire. This happens because requestors will just need to place a check mark, shade, or cross out an item on a list in order to complete a form. They do not have to write all the details about certain aspects of their request. This will help lessen the number of errors when it comes to filling out forms. Also, some items like age range, gender, and educational attainment of a prospective employee are very minor details that someone who is filling out an employee requisition form may easily forget. You may also see simple reimbursement forms. 6. Write a set of instructions at the beginning of the form. This penultimate tip in creating an employee requisition form is very important as it lets anyone who fills out an employee requisition form know what to expect and how to fill out the form properly. Not only is this a form of courtesy to the person filling out the requisition form, but doing this will also help you save time when it comes to evaluating the form later on. Plus, it will also help decrease the number of errors when filling out a simple employee requisition form. You may also see blank order forms. 7. Provide explanations of the different choices or items on the form. Lastly, the tip that anyone who is creating an employee requisition form should follow is to create brief explanations of the different choices or items on the employee requisition form. To illustrate, if you are including a ‘Salary Grade’ option on the requisition form, you may include a short phrase about the different salary amount ranges that each salary grade may cover. 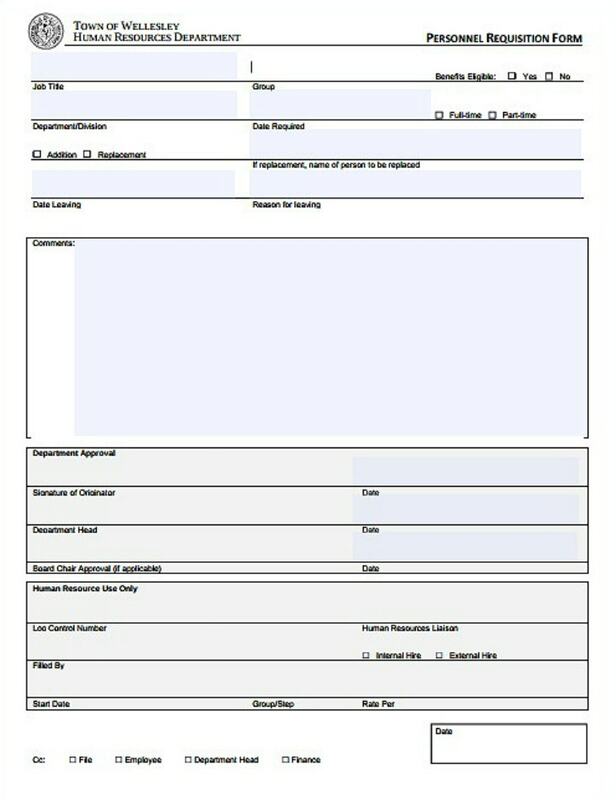 When you do this simple technique, the form requestor will find it easier to fill out the form later on. We hope that you found this article useful and enjoyable to read. Use all the pieces of information that you have learned here in creating the best and most efficient employee requisition form for your organization. Also, do not forget to share the knowledge that you have learned when filling out these job requisition forms. You may also see word order excel templates. And if you have an email list, do not forget to share this article with them along with your other social media followers and friends.